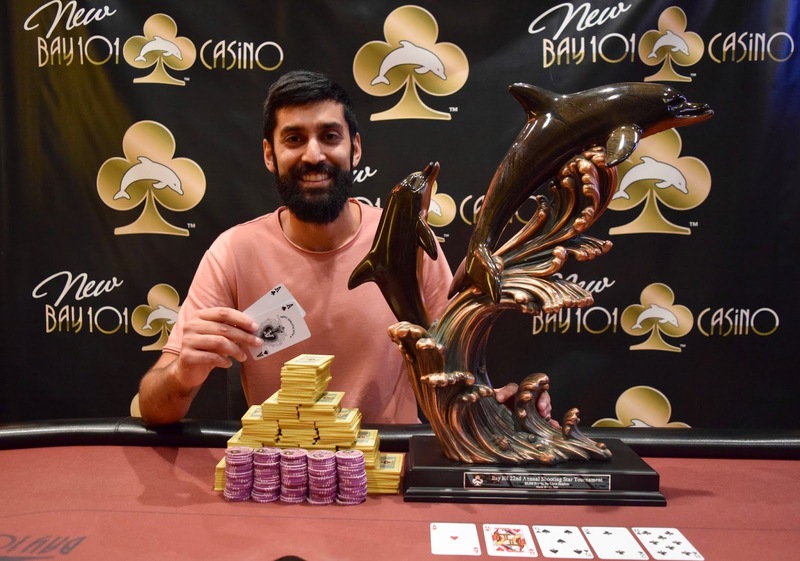 Sandeep Pulusani topped a field of 440 entries to win the Bay 101 Shooting Star Main Event at Bay 101 Casino in San Jose, California on Friday. 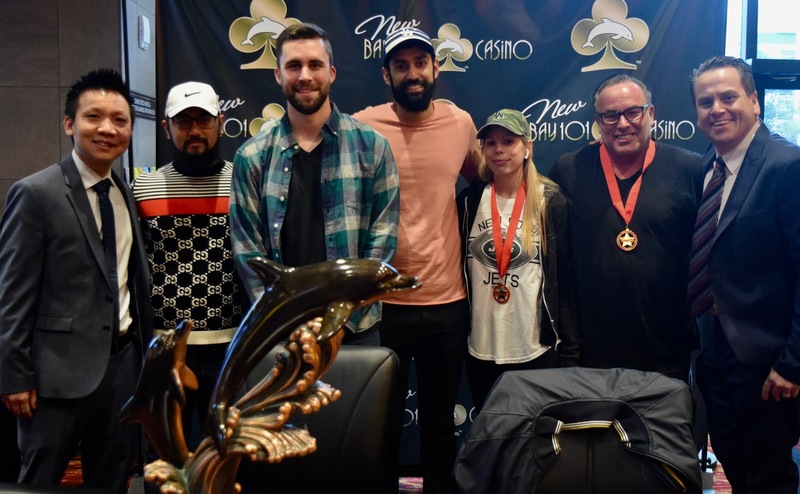 The final day of the tournament saw five players return at the final table, and in just under eight hours of play the champion was crowned. The win takes his career live tournament earnings up to $1,226,214. The final five players were all pretty deep when play began, and that ensured the pace of play would be slow with 90 minute levels allowing for a lot of play. Here is a look at the chip counts when cards got into the air. Andress was the shortest stack remaining, and he was the first player to fall today in fifth place. There was a series of double ups for multiple players before this happend, so Andress didn't hit the rail until almost 3 pm. Shooting Star Loni Harwood entered the day with the chip lead, but the period of early double ups was rough for her. She hit the rail in fourth place around 4 pm. Her exit made Dan Shak the final Shooting Star in the field. He was also the next player to fall in third place. Ryan Tosoc took him out, so he claimed his $2,000 bounty and Shak autographed his shirt for Tosoc on the way out of the field. Tosoc took 12.56 million into the final match against the 5.02 million of Sandeep Pulusani. The final two players then agreed to make a deal. They removed $50,100 from the final two spots to play for and chopped the remaining prizes according to chip counts. As part of the deal, they agreed to play 60-minute levels instead of 90 minutes. 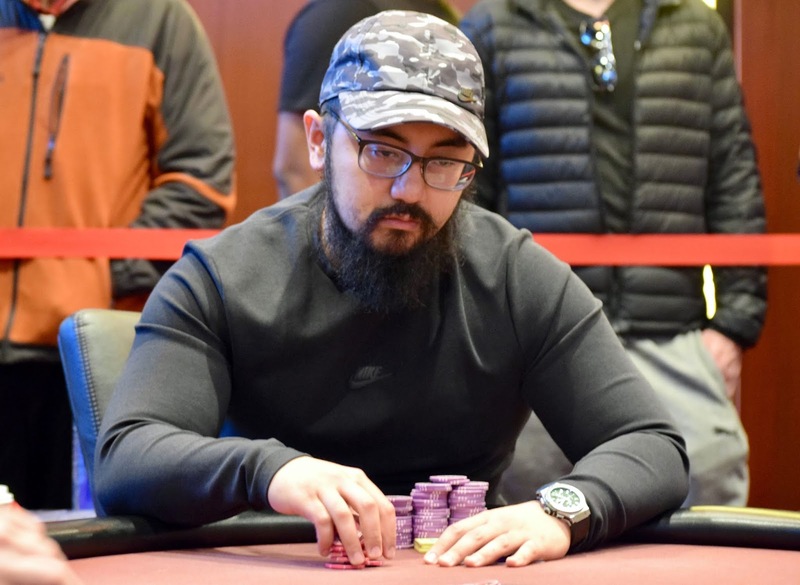 Pulusani scored a big double up with pocket kings against pocket fives to take the lead in the final match, and the next time the two players got their money in the middle the tournament came to a close. On that hand, Pulusani held pocket aces, and Tosoc was all in preflop with [Ah][9c]. The flop brought an ace, and Tosoc was drawing dead on the turn. 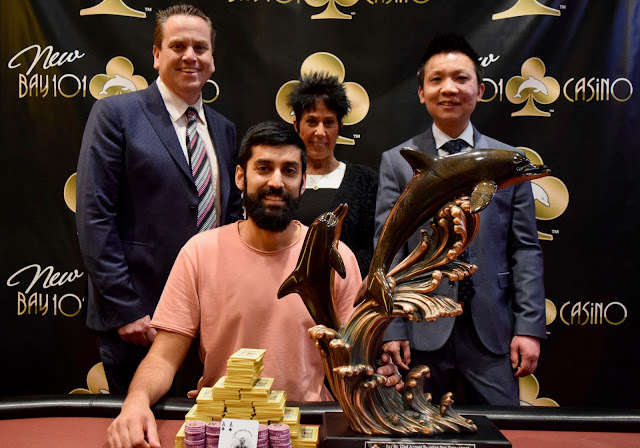 In addition to the prize money, Pulusani also took home a custom dolphin trophy from Bay 101 Casino. That concludes our live coverage from the Bay 101 Shooting Star Main Event. Thanks to all of the player who came out to the event, see you next year in March. 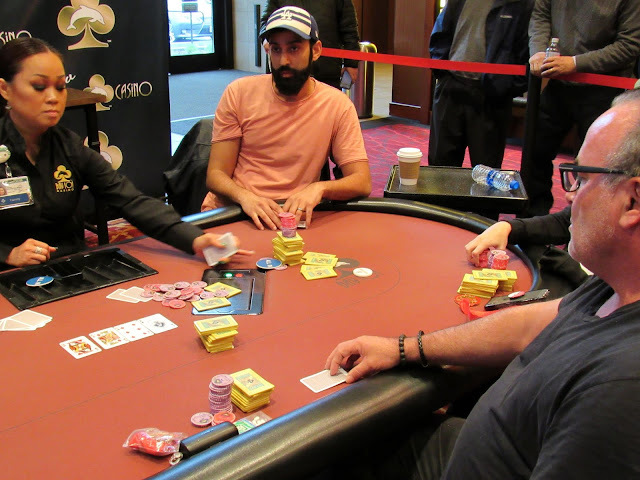 Sandeep Pulusani and Ryan Tosoc get all the chips in the middle preflop - Tosoc at risk and far behind. There's an Ace on the flop - [Ad][2s][Qh] and Tosoc is drawing dead when the [4s] turn comes out. There is 2,075,000 in the pot, and the board reads [9d][8h][4h][Ac][10c] when Sandeep Pulusani bets 2.1 million. Ryan Tosoc tanks for a minute or two on the button before folding his cards. Pulusani stacks up 11.9 million after the hand, and Tosoc is down to 5.6 million. The players are back from break, and blinds have increased to 50,000-75,000 with a big blind ante of 75,000 for the start of Level 28. There are still two players in the hunt to become the next Bay 101 Shooting Star champion. 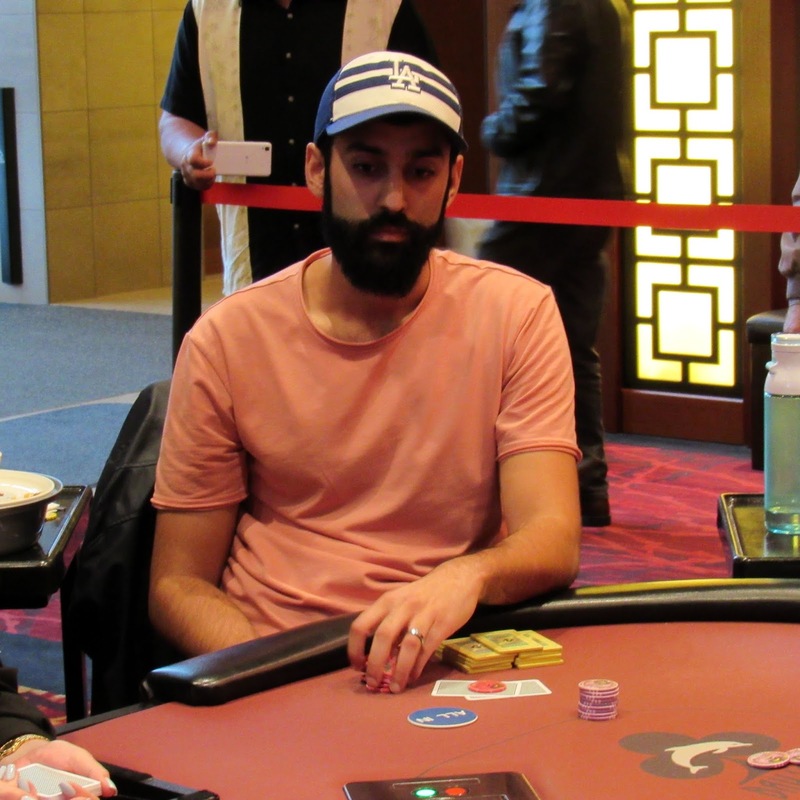 Ryan Tosoc raises to 175,000 preflop on the button, and Sandeep Pulusani reraises to 775,000. Tosoc reraises all in, and Pulusani calls all in for 5,085,000. The two players then flip over their cards. 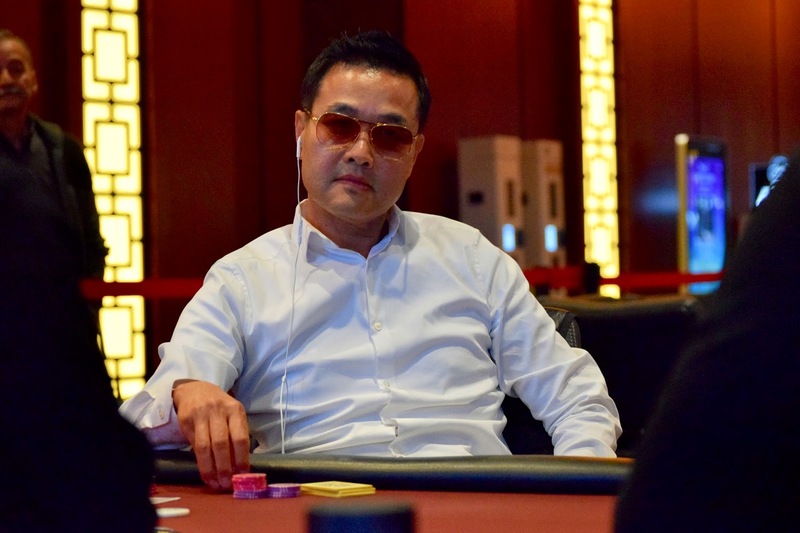 Pulusani doubles up to survive with 10.23 million, and Tosoc holds 7.15 million. As part of the deal, levels will now be 60 minutes instead of 90 minutes. There is 375,000 in the pot, and the flop reads [Ks][Qh][5h] when Shooting Star Dan Shak bets 200,000 from the button. Ryan Tosoc check-raises to 725,000 from the small blind, and Shak reraises all in for 3.76 million. Tosoc calls to cover him so they flip over their cards. Shak is eliminated in third place, good for $200,055, and Tosoc stacks up 12.45 million after the hand. Shak is the final Shooting Star to fall, and he signs his bounty shirt for Tosoc before leaving the final table. Tosoc will also receive Shak's $2,000 Shooting Star bounty. Dan Shak raises to 150,000 preflop from the button, Ryan Tosoc reraises to 475,000 from the small blind, and Sandeep Pulusani reraises to 1.2 million from the big blind. Both opponents fold, and Pulusani stacks up 5,975,000 after the hand. Shak is at 4.3 million, and Tosoc still holds the chip lead with 7.48 million. More than 350bb in play 3-handed for the 2019 Shooting Start title, here's a look at estimated chipcounts. Ryan Tosoc opens for 125,000, Loni Harwood grabs all her yellow 100k plaques, stacks them in front as she announces all in and Tosoc immediately calls. The [6h][9c][Ts] flop gives Tosoc a gutter to a 7. [Ks] on the turn, Harwood moves ahead. Tosoc offers some light-hearted comment but Harwood doesn't change expression, locked in on seeing the river card. [7c] goes the river and Harwood is out in 4th. The first 20 minutes of Level 26 has seen a lot of play, but no hands of consequence. A recent had Ryan Tosoc raising to 125,000 from UTG before Loni Harwood moved all in from the small blind. Dan Shak asked for a count from the big blind, and the dealer counted down Loni's stack to exactly 1,000,000. 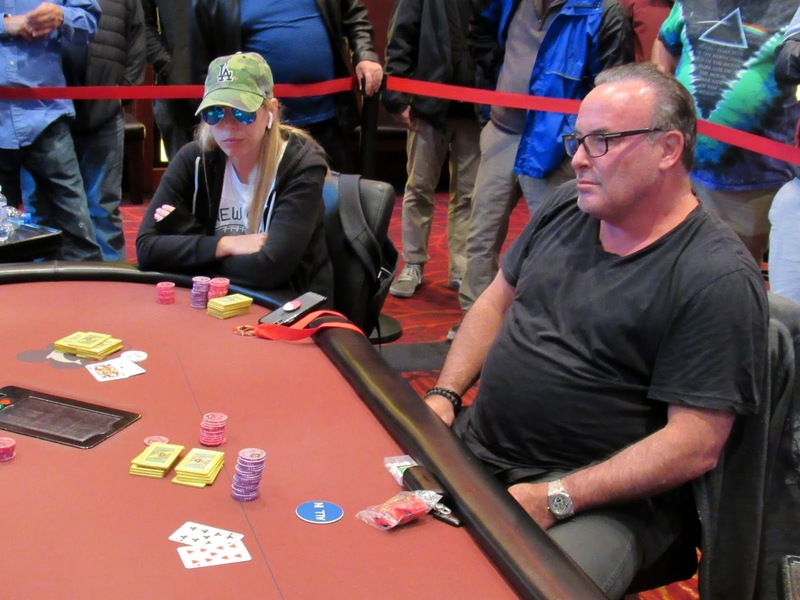 Dan ended up folding, as did Ryan, and Loni Harwood will continue to battle four-handed. The players are back from break, and blinds have increased to 25,000-50,000 with a big blind ante of 50,000 for the start of Level 26. There are still four players in the hunt to become the next Bay 101 Shooting Star champion. The board ran out [Td][Jc][Jd][Qh][Ac] and the pot was chopped, leaving John with 80,000 chips. John would need running sevens or running ten-jack to survive. Seeing his imminent fate, he put on his jacket and backpack as he awaited the turn. The dealer burned and turned the [4s] meaning John was drawing dead. The meaningless [5s] hit the river to officially eliminate John in 5th place, good for $103,710. 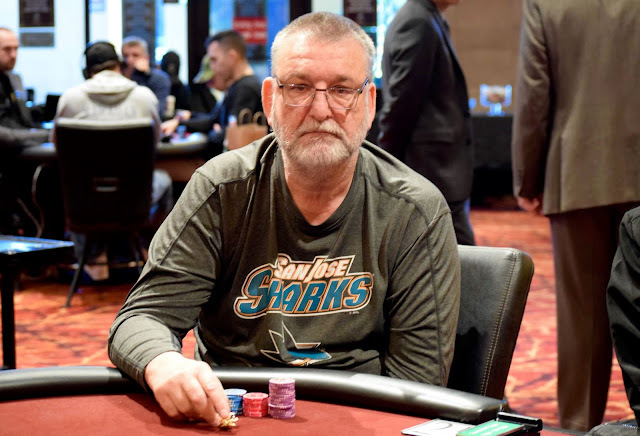 John Andress raises all in preflop for 1.06 million from the button, and Shooting Star Loni Harwood calls all in for 1.03 million from the big blind. The two players then flip over their cards. 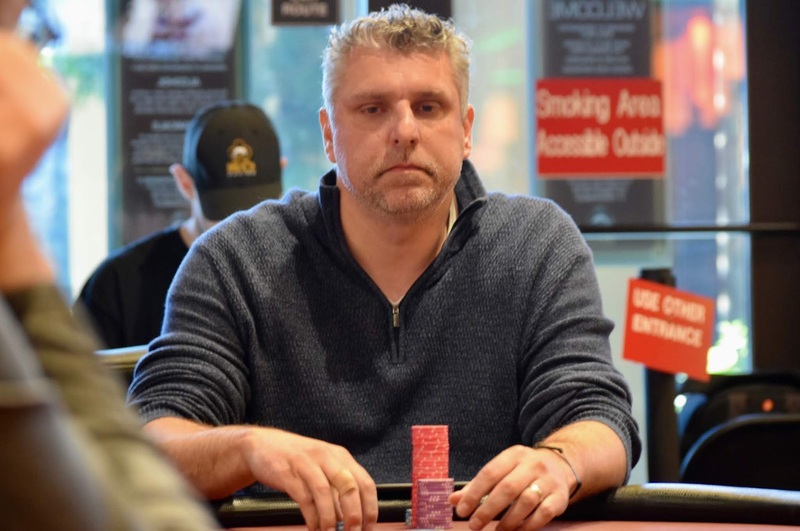 Harwood doubles up to survive with 2.1 million, and Andress is left with just 30,000. 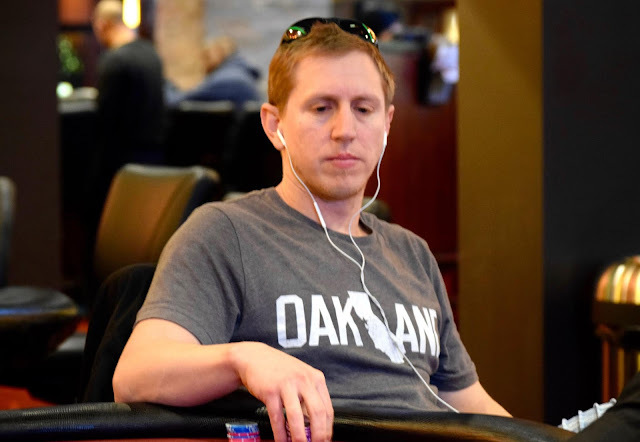 Loni Harwood opens for 100,000, Dan Shak moves in for his last 1,565,000, Ryan Tosoc steps away from the bb and Harwood immediately calls to put Shak at risk. The board goes [3h][Kh][Kd][3s][7h] for a double. John would need some help to survive, and the [Kh][3s][Jd] was exactly the help he needed. The [4h] turn changed nothing, and the [7c] river meant John would double up to 980,000. Meanwhile, Dan was knocked down 1,860,000 chips. 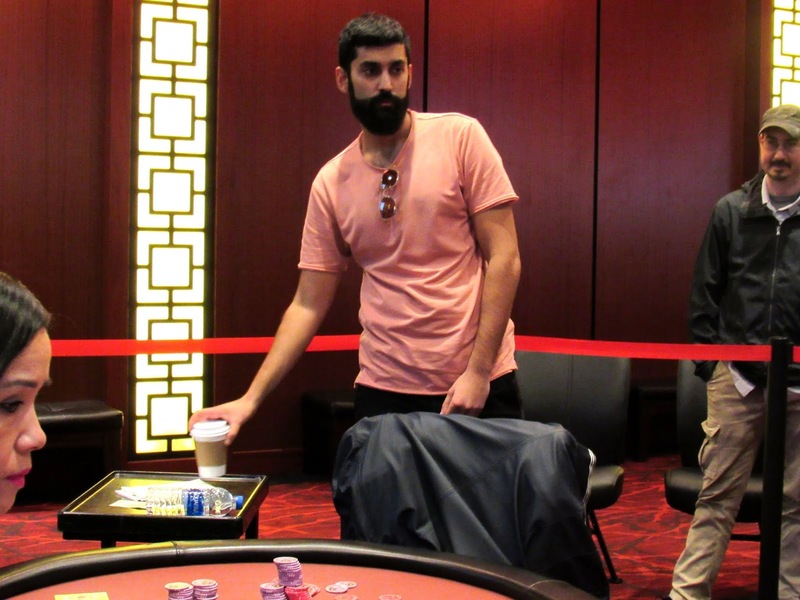 Sandeep Pulusani raised from cutoff and both Dan Shak and Ryan Tosoc called from the blinds. On the [As][6d][Kd] flop, action checked to Sandeep who bet. Dan made the call and Ryan got out of the way. The [Qh] hit the turn and Dan checked again. Sandeep bet 450,000 and Dan elected to check-raise to 1,300,000. Sandeep confirmed with Dan that he was covered, and after some though moved all in for 1,195,000 more. Dan went deep into the tank but eventually decided to fold. The players are back from break, and blinds have increased to 20,000-40,000 with a big blind ante of 40,000 for the start of Level 25. There are still five players in the hunt to become the next Bay 101 Shooting Star champion. 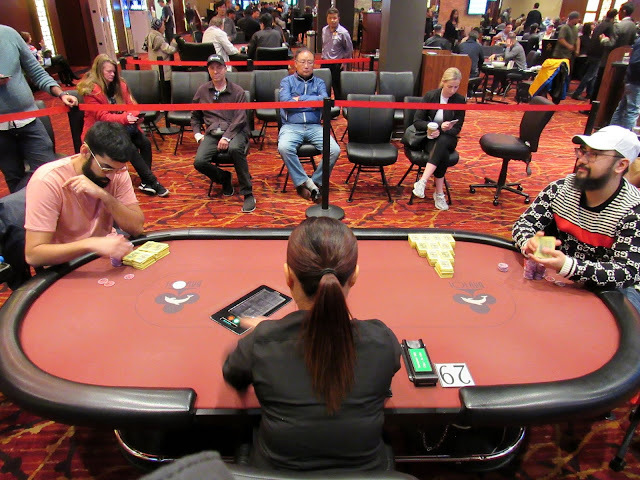 Sandeep Pulusani (pictured left standing) raises to 80,000 preflop from the small blind, and Shooting Star Loni Harwood raises from the big blind. The flop is dealt [Kc][8h][4h], Harwood bets 80,000, and Pulusani check-raises all in for 1,405,000. Harwood thinks for a few moments before calling, and they flip over their cards. Pulusani doubles up to survive with 3 million, and Harwood is down to 2.47 million after missing her flush draw. 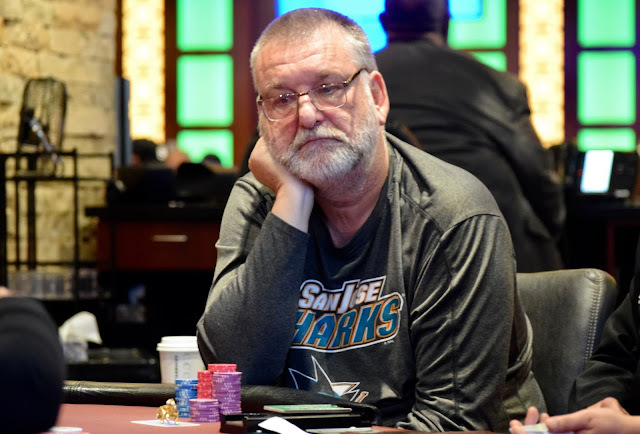 John Andress - the final table short-stack - keeps looking for a spot to chip up, but his challengers are not cooperating. Andress had been al in twice preflop from his BB for a 15bb-20bb stack and could not draw a call. 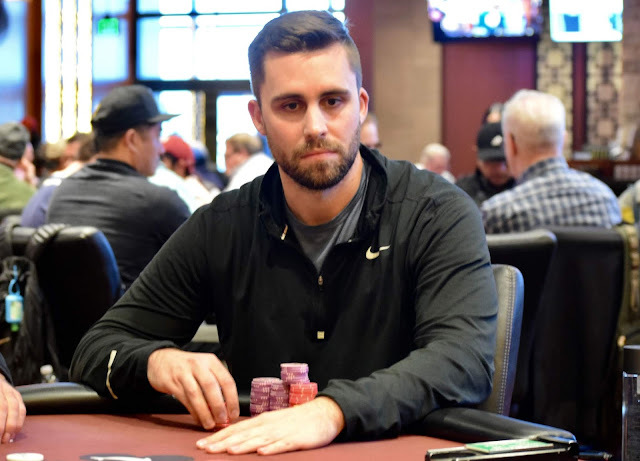 The most-recent play from his bb was a complete from Ryan Tosoc, with Andress checking his option, and all postflop action checked down, Andress earning his blind and ante back along with a 15k sb. 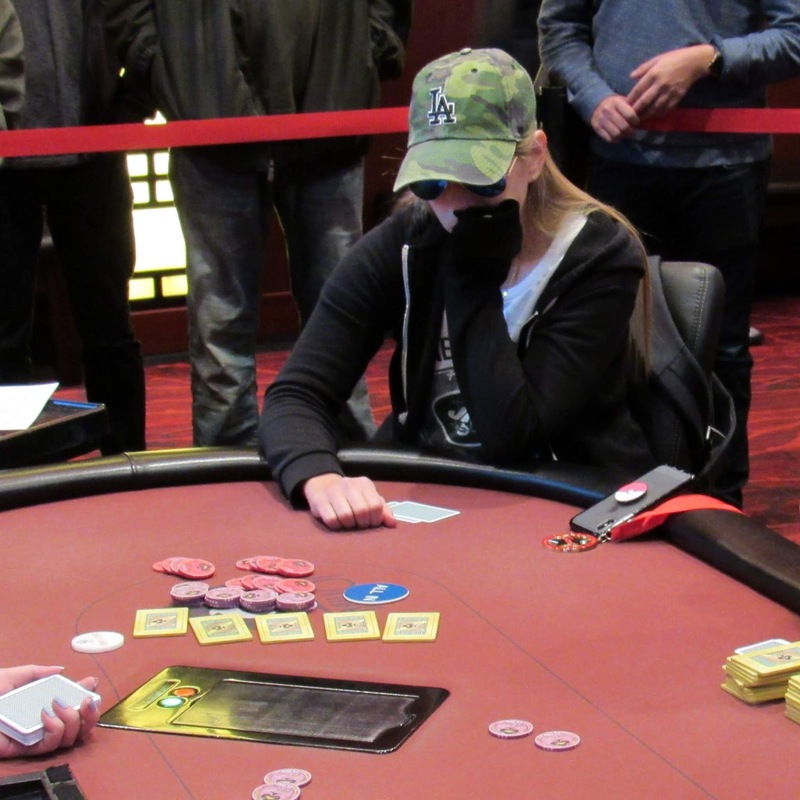 Ryan Tosoc raises to 85,000 preflop from the cutoff, and Loni Harwood calls on the big blind. The flop is dealt [9c][4h][2h], Harwood bets 125,000, and Tosoc calls. The turn falls [10c], Harwood bets 400,000, and Tosoc calls again. The river delivers the [4s], Harwood bets 800,000, and Tosoc calls once more. Harwood immediately folds her cards when Tosoc calls on the river. She is down to 4.23 million, and Tosoc is now the chip leader with 6.3 million. There's more than $20 million in career earnings among the five players at today's Shooting Star final table. Click each player's name to see their Hendon Mob listings of their results. 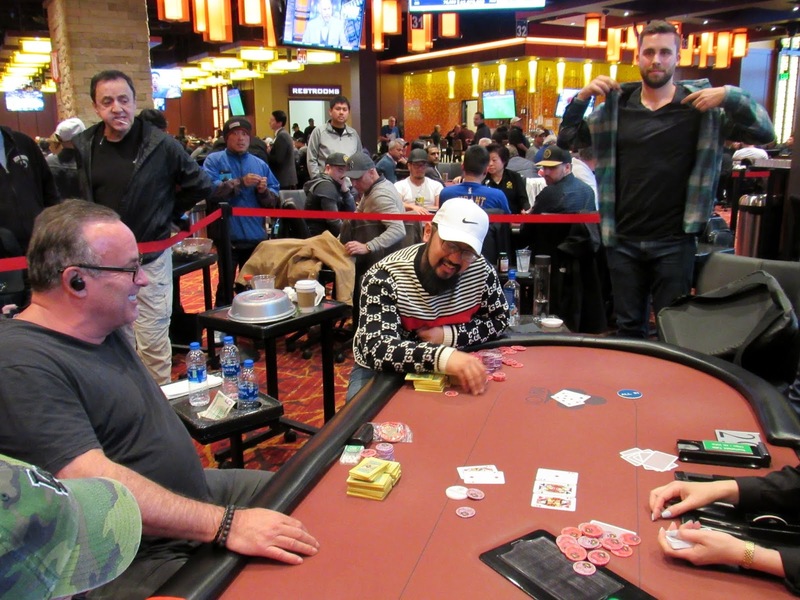 Cards are in the air at the final table of the Bay 101 Main Event. Levels will be 90 minutes long today, and the remaining field will play until a champion is crowned. Shuffle Up and Deal! You can also watch live stream video of the final table over at bay101live.com. 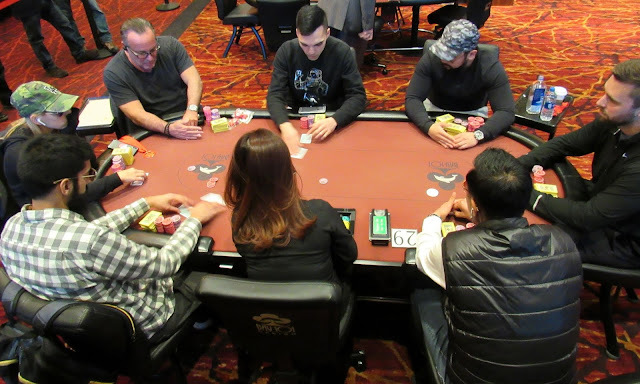 Day 3 at the Bay 101 Shooting Star $5,200 no-limit hold'em Main Event has come to a close with five players advancing to the final day on Friday from 27 players that returned at the start of play. There are two Shooting Star bounties among the group of survivors with Loni Harwood and Dan Shak still in the mix. The chip leader at the end of play is Harwood with 6,040,000. Harwood started her rise when she doubled through Day 3 chip leader Brian Altman early in the day that won her the largest pot of the tournament at that point in play. 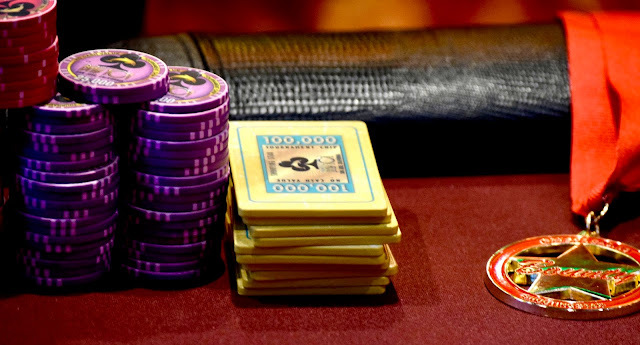 The other stacks remaining belong to Ryan Tosoc (5,045,000), Shak (3,475,000), Sandeep Pulusani (1,645,000), and John Andress (1,380,000). The field charged all the way down to the final table of six a little after 4 pm today, and then those final six players played out the remaining time left in Level 23 before play ended. 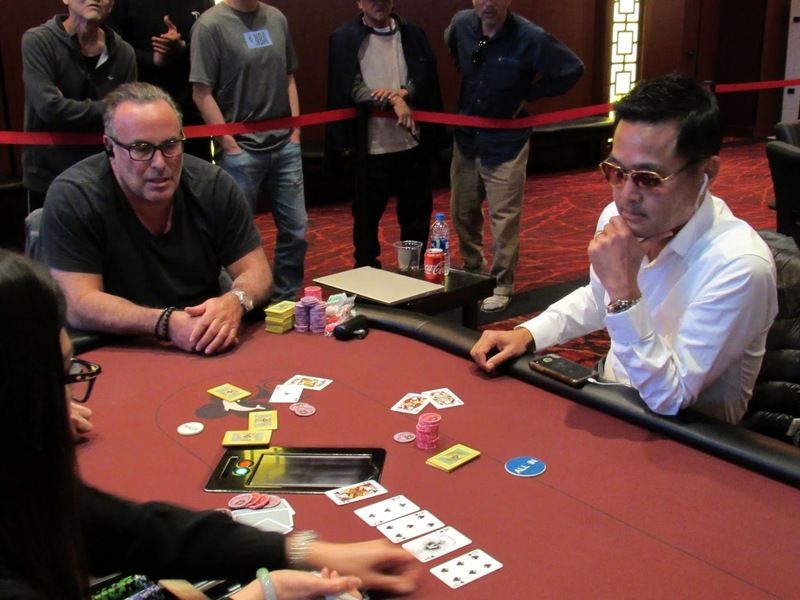 Steve Kim was lost in sixth place during that time, and his bustout came in the craziest hand of the tournament. Kim was all in preflop for 710,000 with pocket aces, and Sandeep Pulusani had him covered holding pocket kings. 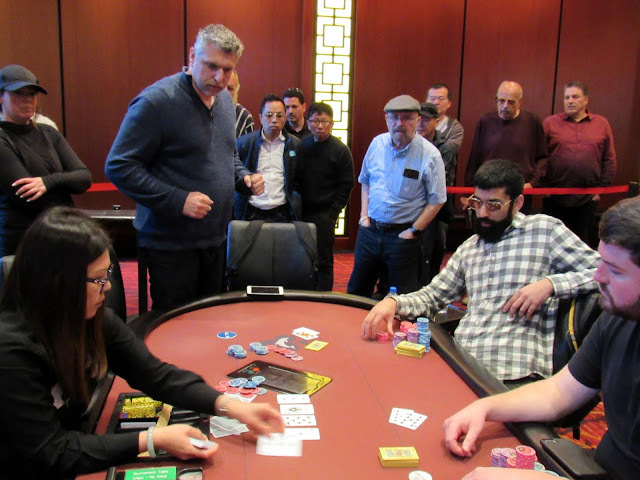 The board ran out Q-10-7-A-J to give Pulusani a Broadway straight on the river that elicited a huge reaction from the players and the surrounding rail. Day 4 will resume at Noon on Friday, and that is when the field will return to continue their march to the champion. Blinds will begin in Level 24 at 15,000-30,000 with a big blind ante of 30,000. Tune back in tomorrow for live updates, chip counts, and photos from the Bay 101 Casino in San Jose, California. One hand after being pushed off a big pot by Ryan Tosoc - costing him 30 percent of his stack - John Andress opens for 60,000 and draws one caller in Sandeep Pusulani. Andress makes it 50,000 to go on the [Ks][4c][ 9h] flop, a call from Pusulani. 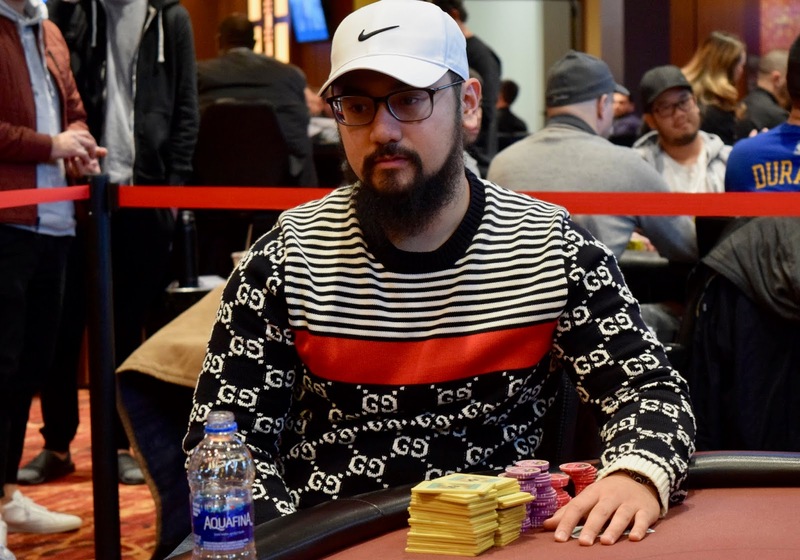 Turn is [4h], two 100k plaques are bet by Andress, Pusulani grabbing a large handful of plaques, betting those and Andress calls off his 525,000 total stack. River [Ad] and Andress doubles up less than 10 minutes from the end of Day 3 play. Steve Kim moves in preflop for his last 710,000 and Sandeep Pulusani - the next to act - takes a reasonable amount of time before announcing he's also all-in for a much larger stack. Everyone gets out of the way and Pulusani quickly flips up [Kc][Kd]. The [7c][Ts][Qc] flop keeps Kim in the lead, and he turns [Ad] for a set, Pulusani down to a gutter Jack for Broadway. 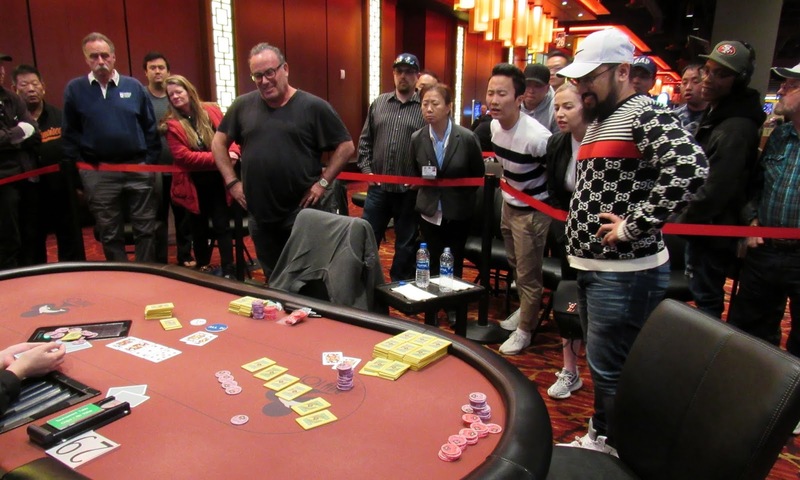 The players at the table, the entire rail, even floor staff gathered around react with a wide variety of stunned comments and facial expressions as Kim is out. Sandeep Pulusani raises to 60,000 from the cutoff and Dan Shak reraises to 265,000 from the small blind. Ryan Tosoc folds the big blind and Sandeep elects to make the call. The flop falls [9s][Kc][5d] and Dan continues for 300,000. Sandeep again calls after some thought. The turn comes [2c] and Dan announces all in. After a few seconds, Sandeep releases his hand and Dan chips up to 3,580,000. 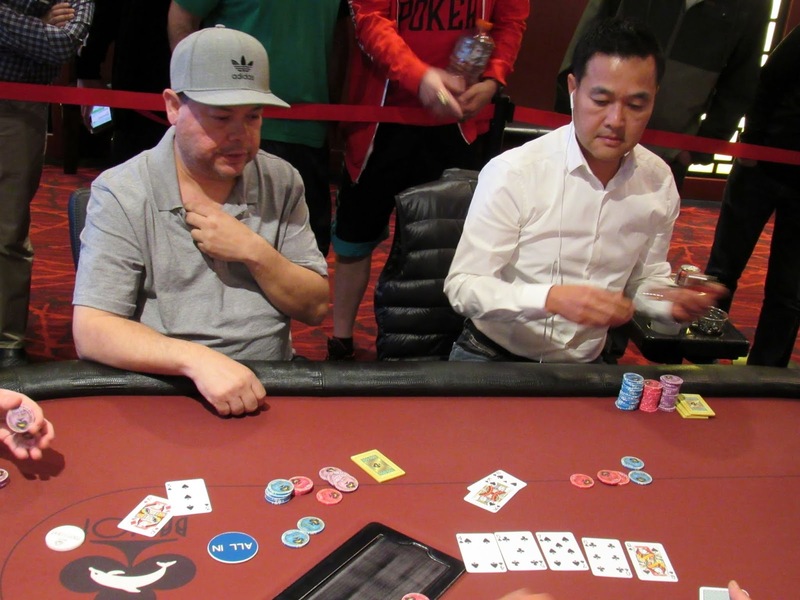 There's 185,000 in the pot preflop, John Andress and Steve Kim - the short stack at the final table - check the [8h][Qh][5h] flop. Andress makes it 100,000 to go on the [Ah] turn and Kim makes the call, leaving himself 625,000 behind. River is [9c] and both players check. 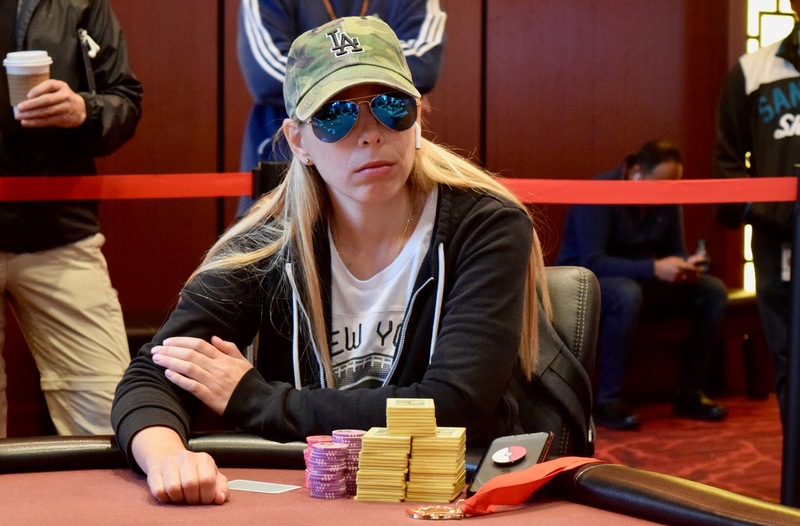 Kim tables [9h][9d] for a flush and Andress mucks. Hiroaki Harada raised to 60,000 and Sandeep Pulusani made the call from the small blind. 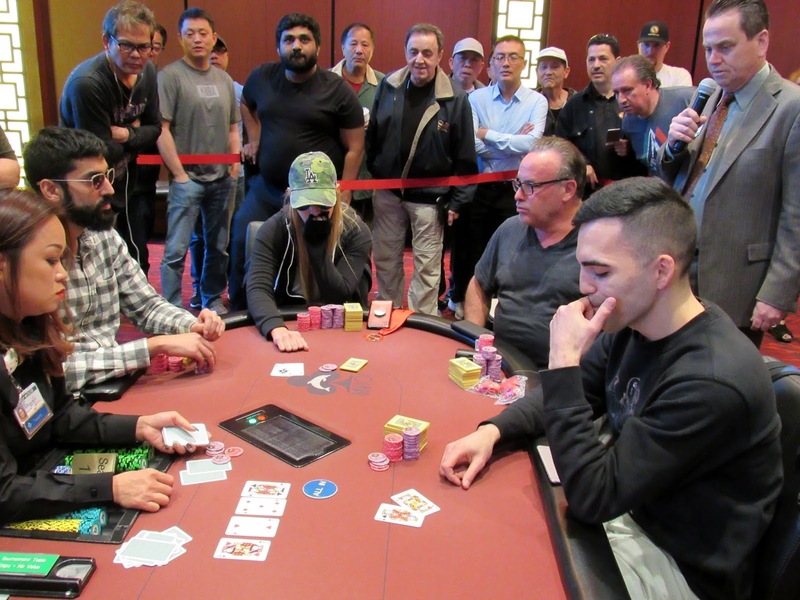 Loni Harwood reraised to 250,000 from the big blind and Hiroaki moved allin. Sandeep got out of the way and Loni made the quick call. Hiroaki was as unlucky as you could be to start this final table, and he was looking for a king to survive. The [Jc][5d][2h][Qh][3d] board failed to provide a suckout, however, and Hiroaki will exit this tournament in 7th place, good for $57,980. 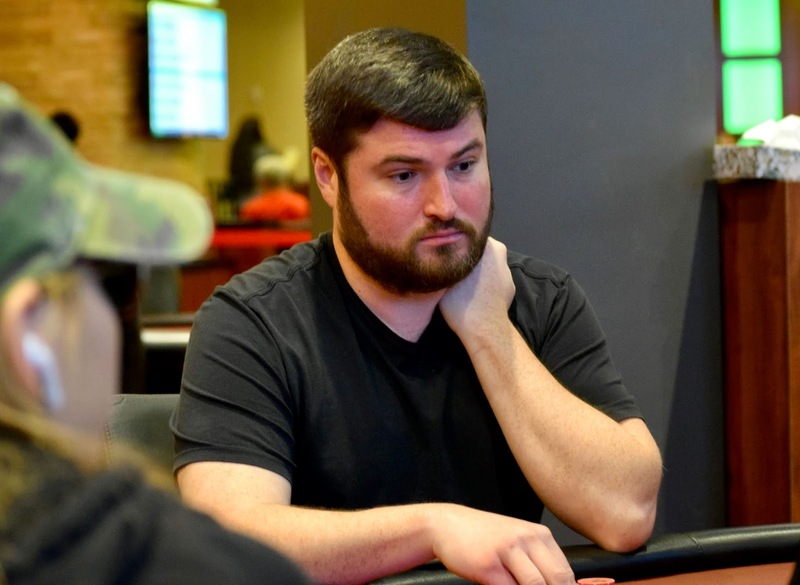 One elimination away from establishing tomorrow's final day of play, the last seven players in the 2019 Shooting Star are now gathered around the final table in the tournament. Antonios Roungeris is all in preflop for 246,000, and Sandeep Pulusani has him covered. Here is a look at their cards. Roungeris is eliminated in eighth place, good for $57,980, and Pulusani stacks up 2.41 million. 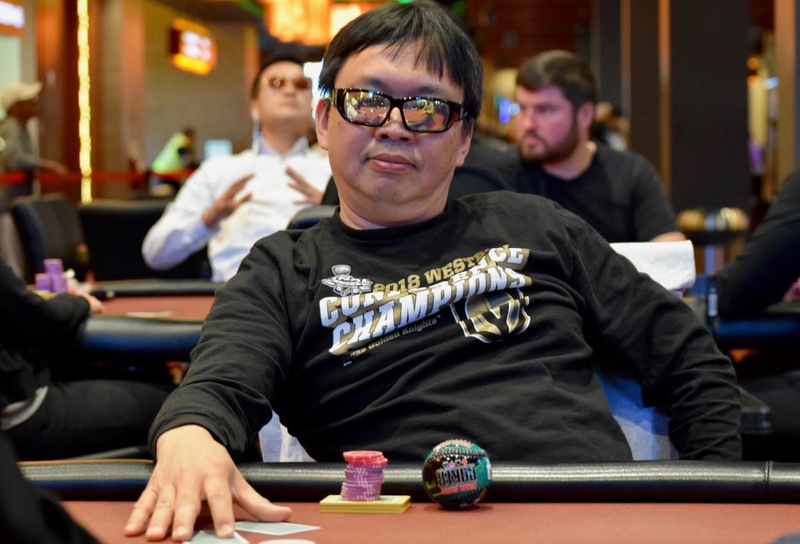 John Ko moves in for his last 300,000 and draws a call from Sandeep Pulusani. The board runs out [5d][2c][3c][Ah][Ad] and Ko is out two from the final table. Action folded to Dan Shak in the small blind who raised. 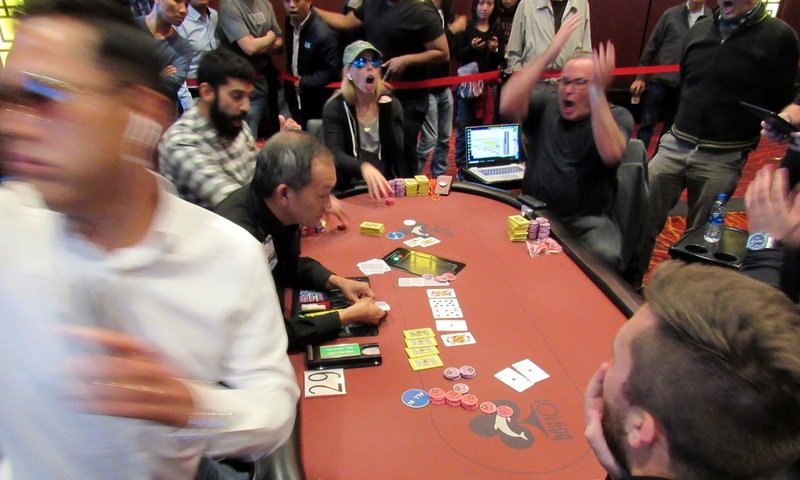 Steve Kim reraised all in for not much more in the big blind and Dan made the call. When the [Qc][3c][5s] flop fell, the rail exploded in support of their local player. The [As] turn paired Dan but he was drawing dead. The meaningless [6s] hit the river, and Steve doubled up to 670,000. 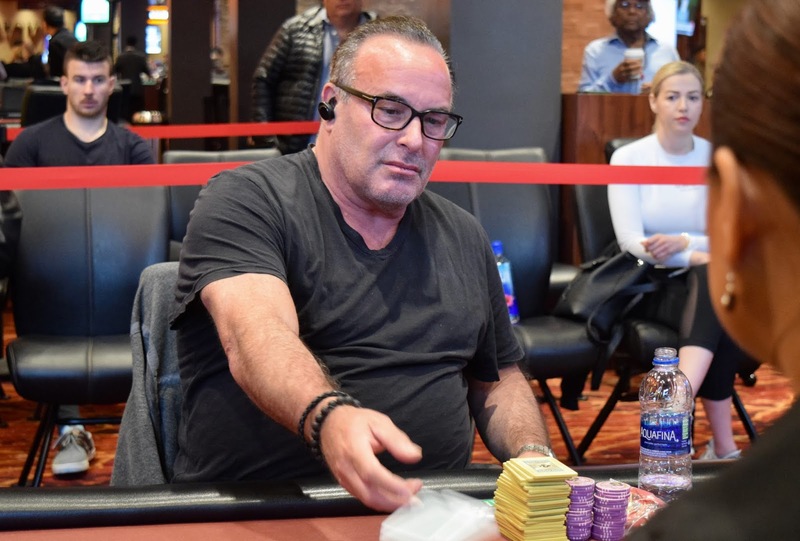 The blinds increase to 15,000-25,000 with a 25,000 big blind ante for the start of Level 22 on Day 3 at the Bay 101 Shooting Star Main Event. There are currently nine players remaining in the hunt to advance to the final table on Friday. The players are taking another 15-minute break. 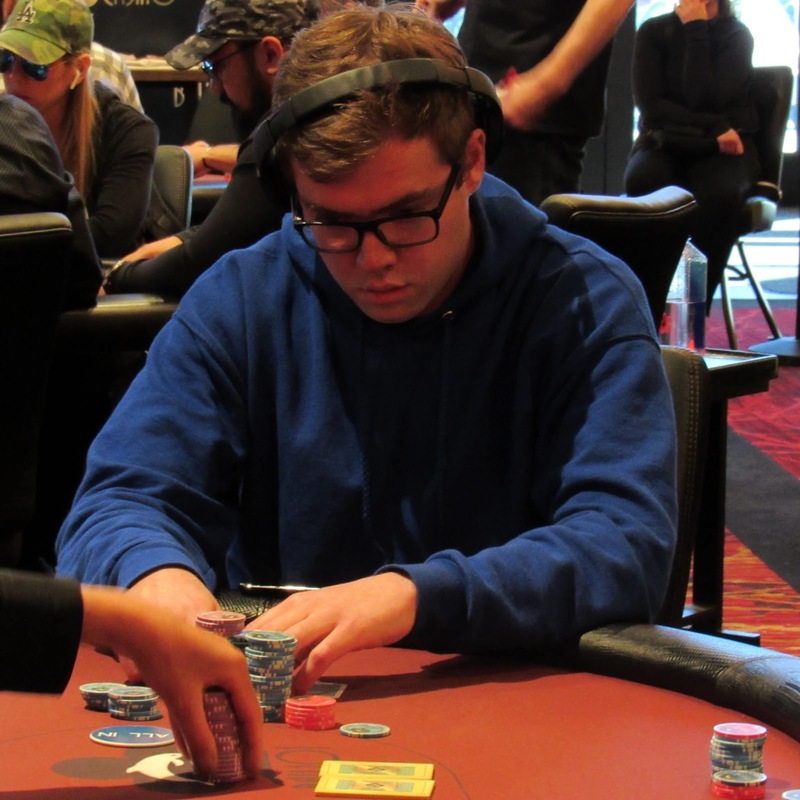 James Caroll raised UTG to 45,000 and found callers in Ryan Tosoc in the hijack, Jon Ko in the small blind, and Sandeep Pulsani in the big blind. The flop fell [2s][7s][8d] and James moved all in after being checked to. Ryan called, and the remaining two players folded. Ryan had flopped top pair and a flush draw but James had many outs a bigger flush draw, a gutshot, and two overs. The [Qd] turn and [6d] river failed to improve James's hand and he will exit this tournament in 10th place, good for $44,555. Guy Hadas is all in preflop for 460,000 from the cutoff, and Ryan Tosoc has him covered from the button. Here is a look at their cards. Hadas is eliminated in 11th place, good for $34,875, and Tosoc is up to 2.78 million. 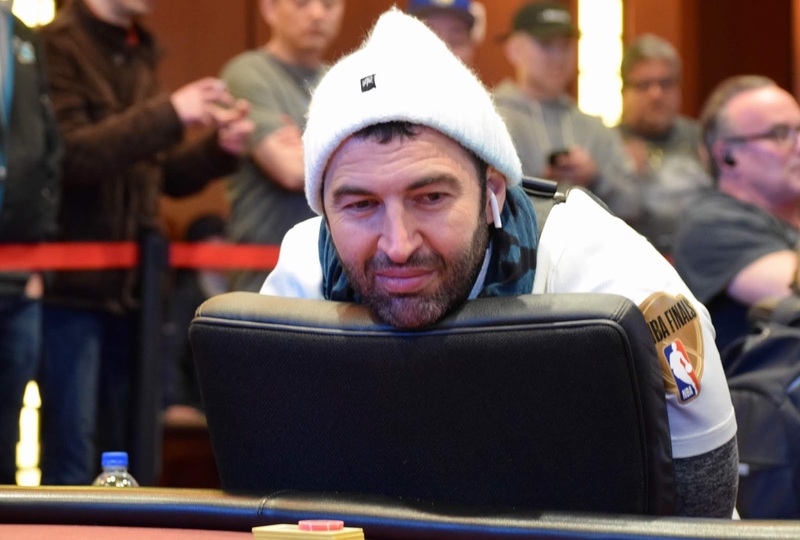 The flop reads [8h][7c][6s] when Yotam Shmuelov (pictured) gets all in for 245,000 from the small blind, and Ryan Tosoc has him covered on the big blind. Here is a look at their cards. Shmuelov is eliminated in 12th place, good for $34,875, and Tosoc stacks up 1.94 million thanks to a flush on the river. 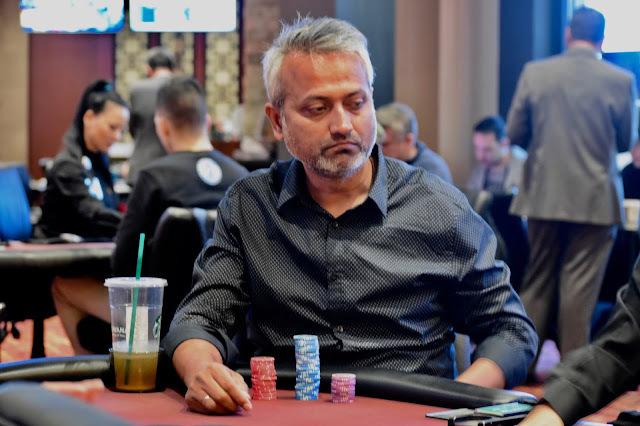 John Ko is all in preflop for 280,000 on the button, and Sandeep Pulusani has him covered holding [Kc][Kh] on the small blind. The board falls [As][Qd][Jc][Jh][8c], and Ko doubles up to survive with 610,000. Pulusani holds 2.4 million after the hand. A few hands after doubling up Yotam Shmuelov for the third time, Axel Werner moves in preflop for his last 300,000 and is called by Sandeep Pulusani. The board goes [8c][9c][4d][2h][5c] and Werner is out in 13th. Axel Werner is all in on a short stack with [Ah][6c] in the hole from the small blind, and James Carroll has him covered holding [8c][7d] from the button. The board runs out [Qh][Qd][2c][9c][Ks], and Werner doubles up to survive with 350,000. Carroll holds 1.51 million after the hand. Axel Werner opens for 45,000 and Yotam Shmuelov slows the pace with a pay jump looming. Shmuelov eventually puts out 140,000, leaving himself a single red 5000-chip behind as a card protector. Action folds back to Werner who puts out 145,000, thinking Shmuelov is all in, but the dealer kicks back a 5k chip and off to the flop they go. Werner immediately flips out a 5k chip and Shmuelov tanks. Sandeep Pulusani calls clock and James Carroll calls for Matt Savage. A brief discussion takes place about how fast the clock was called, with Savage replying to Shmuelov. "You know why they did this, right?" Shmuelov nods in agreement and puts out the chip. The board goes [Kd][Jd] and Shmuelov doubles for the fourth time in the last two hours, moving to 300,000, Werner drops to the same stack. 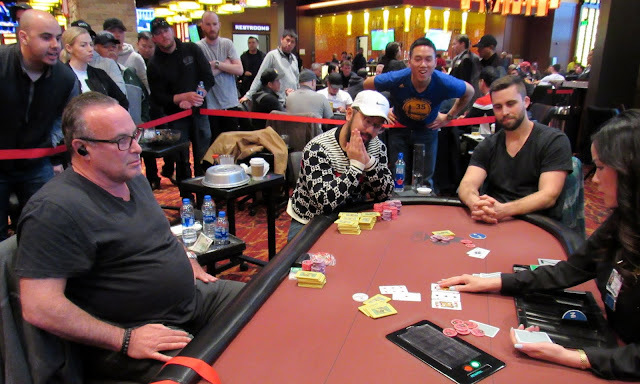 Action folds around to John Ko in the sb who doesn't hesitate to toss his last 175,000 in the middle. "You don't want to think about it," jokes bb Loni Harwood. "I don't need to think about it," laughs Ko. Harwood calls and off to the flop they go. [2s][Ts][Ks] and Ko takes the lead, the board finishing up [2h][Jd]. Michael Dyer (pictured) opens the pot with a raise, and one player calls before Dan Shak reraises to 220,000. Dyer reraises all in for 1.15 million, the third player gets out of the way, and Shak calls to cover him. The two players then table their cards. Dyer is eliminated in 14th place, good for $27,825, and Shak stacks up 2.49 million after collecting the pot. 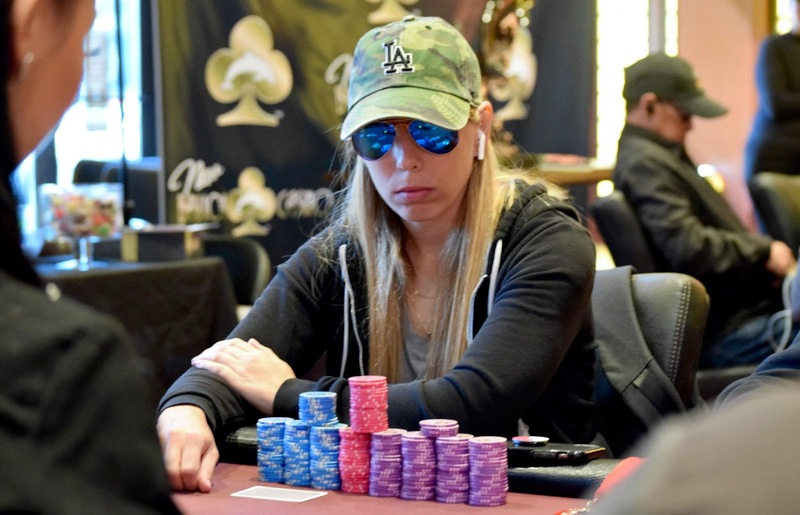 Loni Harwood has better than a 1 million-chip lead as the final 14 players return from break in Day 2 of the Shooting Start. here's estimated chipcounts for the field. The blinds increase to 10,000-20,000 with a 20,000 big blind ante for the start of Level 22 on Day 3 at the Bay 101 Shooting Star Main Event. There are currently 14 players remaining in the hunt to advance to the final table on Friday. 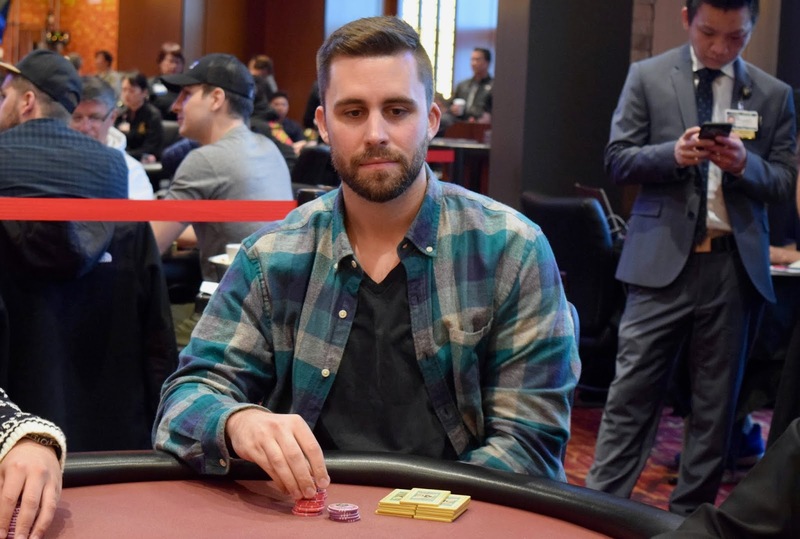 Yotam Shmuelov is all in for his last 141,000 holding [Ah][Kh] and is up against the [Ts][9d] of James Carroll. 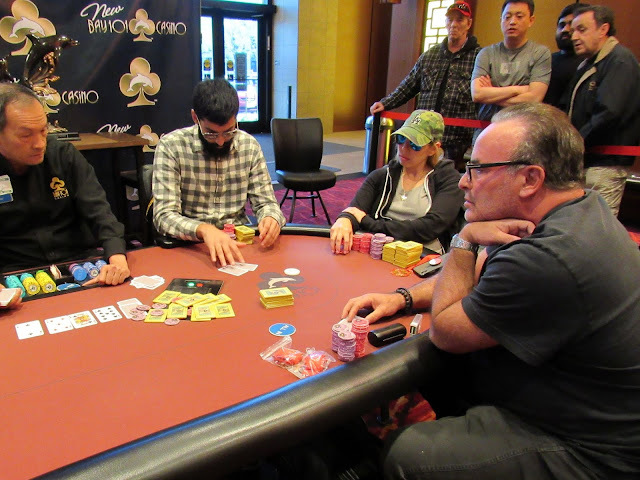 The [5d][7d][7c] flop keeps ace high in front, but the [8s] gives Yotam a bit of a sweat as James picks up an open ended straight draw to go with his two live cards. 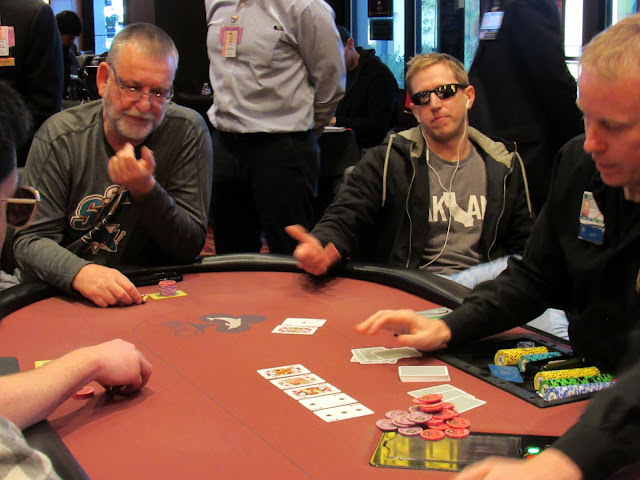 The [2s] hits the river to double Yotam up on the last hand before break. Guy Hadas is all in preflop with [Ad][Qc] in the hole under the gun, and James Carroll has him covered from the button holding [9c][9d]. The board is dealt [As][8c][3d][Ah][3h], and Hadas doubles up to 435,000. 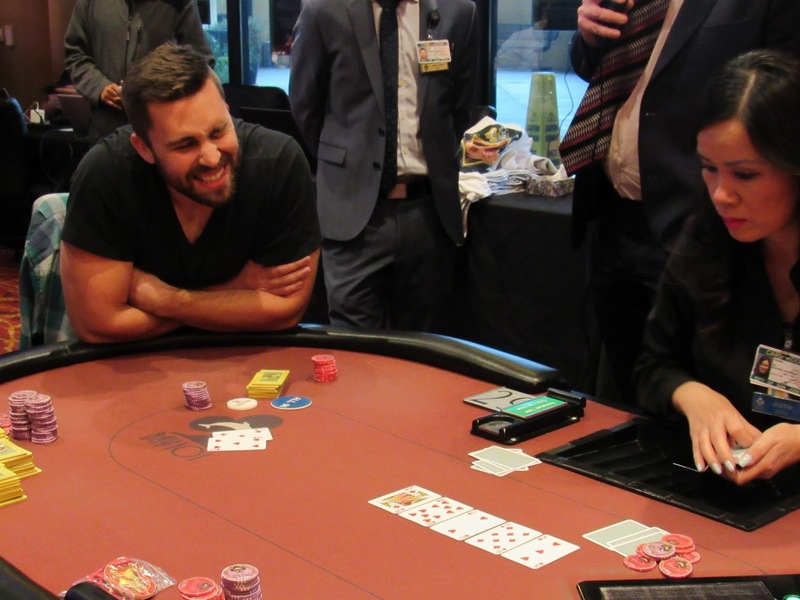 Carroll holds 1.8 million after the hand. 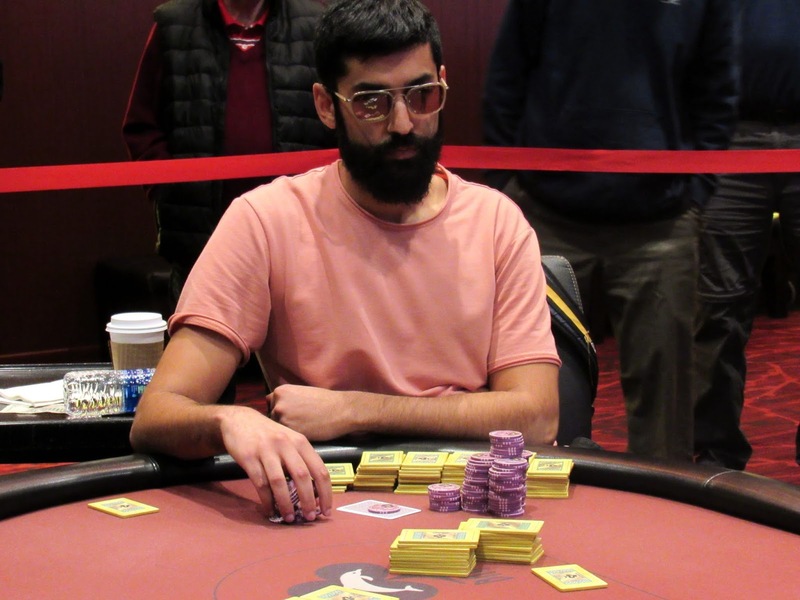 Sandeep Pulusani opens for a 32,000 minraise, Axel Werner comes along from the sb and Yotam Shmuelov - with 95,000 behind - takes about 30 seconds before deciding to just call from the bb. [8d][4h][Tc] goes the flop, Werner bets 45,000 and Shmuelov's last 79,000 come extremely close to beating Werner's chips in to the pot. Pulusani mucks and up go the cards. The turn and river run out [6c][5s] and Shmuelov, for the second time this level, doubles through Werner. James Carroll opens to 32,000, action folds to Guy Hadas in the bb and he moves in for his last 241,000. Carroll asks for a count and makes the call. Hadas jumps in front as soon as the [Qc] shows in the window. The rest of the board goes [6s][7s][Qd][5s] and Hadas doubles to 300,000, with Carroll slipping back a bit to 1.25 million. Action folded to Jimy Zeledon in the small blind and he moved all in for 202,000. 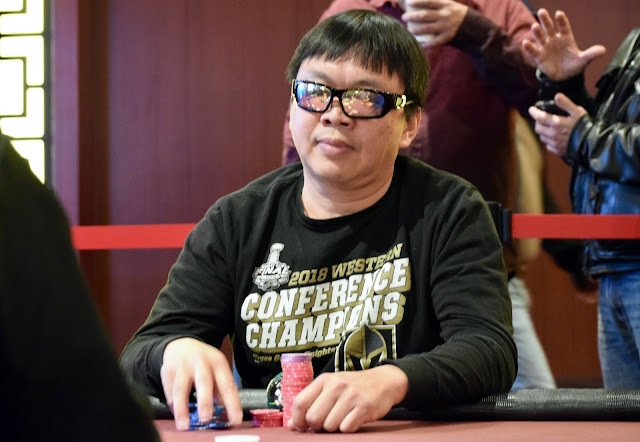 Steve Kim in the big blind made the call and exposed [Ks][Ts] which was ahead of Jimmy's [Qd][3s]. The [4s][5c][7s] flop gave Jimmy a gutshot straight with his two live cards, but he had to avoid a spade as Steve had picked up a flush draw. The [6c] was the magical card Jimmy wanted, filling his straight. 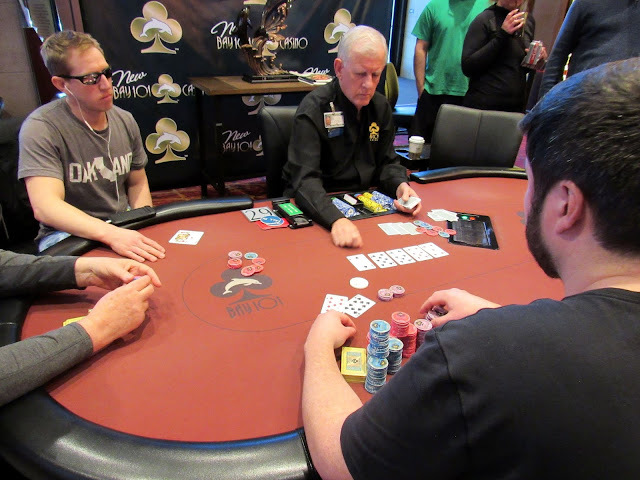 But the [Qs] hit the river to complete Steve's flush, and Jimmy will have to settle for 16th place. He will collect $22,635 for his efforts.